For Helsinki City Museum, an imminent move to new premises provides the ideal opportunity to explore these very questions. Participation and involvement have been central concepts as the museum reconsiders its raison d’être – both in terms of process (regular questionnaires have been sent out to a panel of residents) and in terms of visitor experience. This week – on Back to the Future Day appropriately enough – saw the announcement of a new ‘time machine’ that will combine the technological expertise of Finnish digital agency Futurice with the museum’s extensive collection of some 400,000 objects and one million images relating to the history of Helsinki. The exact nature of the time machine remains to be seen (it’s still in prototype phase) but the aim is to makes use of the latest technologies to create a fully immersive, emotionally engaging experience. The time machine is one way that Helsinki City Museum is ‘rethinking the role of the museum in the city,’ according to museum director Tiina Merisalo. This, of course, runs two ways: the museum responds to the changing culture of a city that it has itself helped to shape. The museum’s move is part of a larger redevelopment of the area around Senate Square in central Helsinki. I’m told more shops and office space will be introduced into the small cobbled streets that lie along the main tourist route between the ferry drop-off and Helsinki Cathedral. When it opens in May 2016, the new museum will link together a number of historic courtyards as well as the Children’s Town exhibition, which closed for renovation in 2014. The aim is to create a ‘museum quarter’ in a handsome, but slightly overlooked, corner of the city. As discussed in this column back in April, the relationship between the museum and the city is coming under increasing scrutiny. Across the Nordic nations a number of exhibitions and events have been taking place that examine this complex and changing dynamic. A recent conference in Malmö, Sweden sought specifically to address the space ‘between dissent and discipline’ in relation to art and public space. 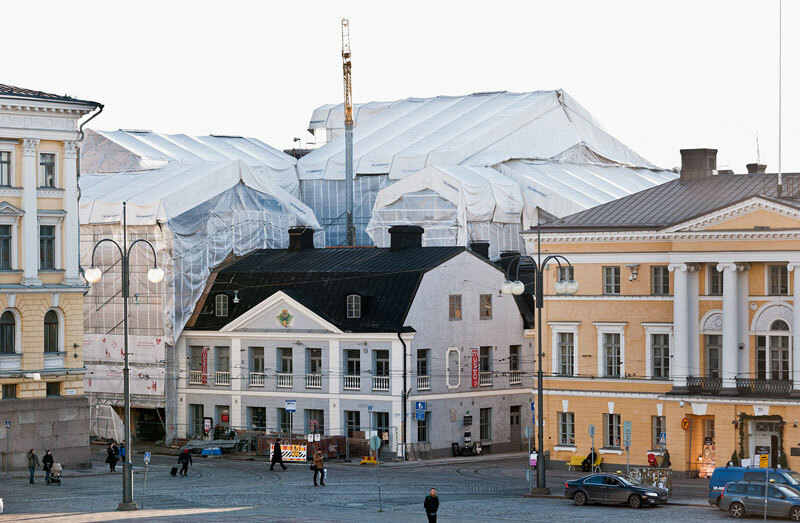 Meanwhile, Färgfabriken is hosting Experiment Stockholm (until 29 November), a full programme of exhibitions, seminars and debates exploring the future of the city through both art and urban planning. Part of the programme has involved a public design contest on homelessness arranged by Architects Without Borders. One of the proposals – a mobile mass of shipping containers – seems at best insensitive. But even that pales in comparison to legislation recently considered by politicians in Norway – one of the world’s richest nations – that would have made begging illegal. 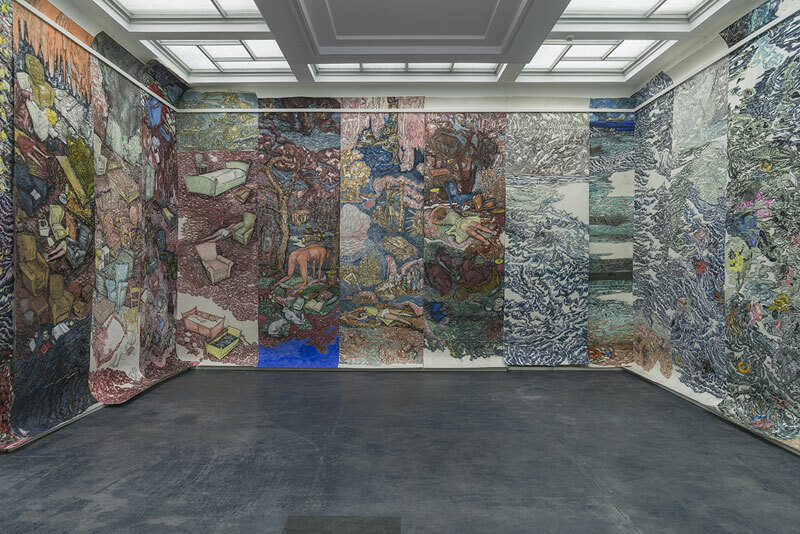 The controversy surrounding the proposal informs Ane Hjort Guttu’s film Time Passes, which is currently on show at Trondheim Kunstmuseum as part of the Lorck Schive art prize (until 28 February). The rest of the shortlist for the NOK 500,000 prize is similarly political: Vanessa Baird’s mixed media drawings depict the suffering of refugees crossing oceans in overcrowded boats, while Snorre Ytterstad’s installation responds to the barriers we’ve erected to prevent them from entering Europe. Bringing all these diverse elements together in more practical fashion is Refugees for Co-Creative Cities. (Thanks to Timo H for linking to this from Urban Finland) The project has been conceived by Kitev, a collective of artists and architects based in Oberhausen, Germany. ‘Refugees come to Europe with hope for better life,’ say Kitev, ‘but we feel ashamed by the way they are hosted now. We, Europeans, can do it better.’ The aim is to improve both the daily lives of refugees and public space in the Ruhr region. Kitev will work with incoming refugees to renovate abandoned buildings in the region. In doing so, they hope to do away with the violence imposed on the stateless in fenced-off accommodation centres, and at the same time help new arrivals to ‘find their position in the public sphere’. Perhaps this is what buzzwords like ‘engagement’ and ‘interaction’ really ought to mean. Can Finland’s art scene survive in the face of declining public funding, lack of economic security, and oversupply of labour?